Save The Ribble: Preston City Council Looking to "Build All Over " South Ribble? Preston City Council Looking to "Build All Over " South Ribble? Tory MP Eric Pickles claimed in Parliament yesterday that Preston City Council's continued wish to abolish Lancashire County Council and merge with South Ribble Borough in a unified Authority is so that they can "build all over" South Ribble. ‘We already work with South Ribble and… Chorley and… other areas. We’re not looking to expand all over South Ribble – I think that’s a scare story and it does no good if the Tories whip people up with scare stories.’ (LEP 19.4.07 p8). ...or maybe, all over South Ribble AND Chorley AND West Lancashire...? 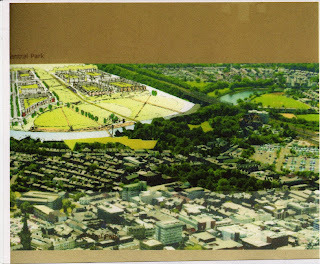 As we have seen in Preston City Council's Riverworks documents, and in their new glossy Preston Economic Regeneration Strategy and Prioritised Action Plan (PERSPAP) brochure, their proposals for 'the development of a barrage across the river... and the development of a new "Central Park" with associated residential development' are termed as 'Key project proposals' (PERSPAP p7). The Penwortham Green Belt, earmarked by Preston City Council for 4,000 new houses, business parks and retail developments, with a small remaining portion stripped of its biodiversity to turn it into a formal park. ...and just in case John Collins's geography is a little hazy, we would like to point out that Penwortham is in South Ribble. 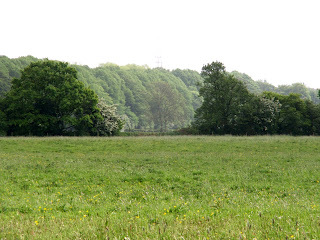 In fact, Preston City Council have claimed in a number of their documents that South Ribble's Green Belt designation presents an obstacle to the massive housing and business park developments in Preston's Riverworks proposals, and as such, Preston would like to remove these South Ribble areas from Green Belt designation to ease the passage of their building developments. One of the documents in which PCC claim this is the Central Lancashire Sub-Regional Spatial Strategy, a document drawn up by GVA Grimley (property advisors and consultants) for a partner group which includes Preston City Council and South Ribble Borough Council. This document argues for 'the major location for growth…..in the wider Preston area which "straddles" the River Ribble', building on Penwortham Green Belt a 'new sustainable community supporting the growth of the City centre' (Central Lancashire City p.24). To achieve this it is proposed that 'consideration needs to be given to strategic Greenfield release' as Green Belt designation is a direct 'threat' to the proposal, thus 'a review of the greenbelt south of the River Ribble should be considered' (ibid p.18/19). Some South Ribble Borough Councillors have made it clear that they see the Green Belt as “sacrosanct”. But the question is whether that opinion would hold sway in a unitary authority council chamber, particularly in view of the stated support of the leadership of South Ribble Borough Council for the Riverworks Vision. As long ago as 2005, as part of their Big Lottery bid, PCC stakes a claim for the Riverworks project as the core of a new city centre for Preston which viewed South Ribble as part of a wider Preston City. PCC want to develop 'a new city along an underutilised river valley that currently separates two halves of (the) established urban structure' of Preston and South Ribble. The Council see the Riverworks project as a symbol for the new City region, viewing their proposed Ribble barrage and so-called "Central Park" building development as 'connect(ing) together the two halves of the city' (PCC Lottery Bid Appendix A: RiverCity Project). As can be clearly seen on Preston City Council's Composite Masterplan, practically every green space in Penwortham is earmarked for building developments, including the entire provision of allotments and football pitches in Penwortham, as well as the Green Belt. Preston City Council's "Composite Masterplan", reproduced on Taylor Young architects website. This whole area is, of course, also operational floodplain, upon which the Environment Agency are opposed to any further building developments as this increases the risk of flooding or exacerbates floodrisk elsewhere. See more details about the threat to our River and Green Belt Preston City Council would pose as a dominant Local Authority. 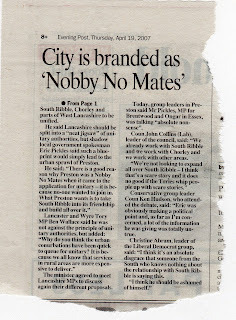 Preston City Council's continued wish to become a single Authority with South Ribble and Chorley and West Lancashire - despite an overwhelming 73% Preston residents and 90% of South Ribble residents rejecting the proposals (which led to South Ribble Borough Council withdrawing from the joint application) - shows their determination to pursue their own agenda. 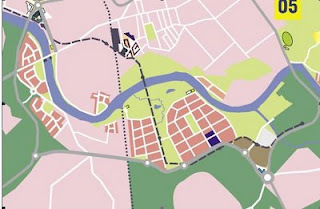 By becoming a single Authority, with jurisdiction over South Ribble and other areas of Lancashire - West Lancs, like much of South Ribble, also running alongside the River and custodians of huge areas of undeveloped Green Belt - Preston City Council hope to achieve their stated ambition of becoming a huge urban conurbation like Manchester and Liverpool, regardless of what local residents want for their communities and environment. 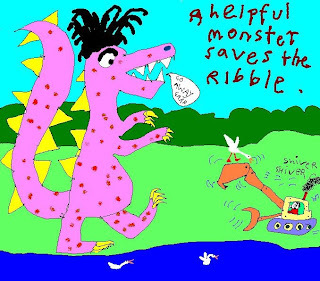 Our young friend "I" and has sent us another of his fabulous pictures which put residents' sentiments very well indeed! Long Live the Ribble very Wild!! !